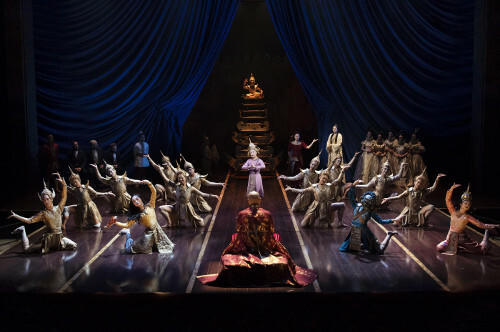 It's hard to go wrong with Rodgers and Hammerstein’s "The King and I." But when everything goes right, as with Lincoln Center's current revival, it’s truly magical. The venerable musical stars the extraordinary Kelli O'Hara as Anna Leonowens, the prim and very proper schoolteacher; and Japanese film star Ken Watanabe as the King of Siam. Onstage together, they make the sparks fly. But the supporting cast is equally electrifying. Ruthie Ann Miles, who plays the king’s chief wife, Lady Thiang, can tear your heart out with her rendition of "Something Wonderful." And Ashley Park (Tuptim) and Conrad Ricamora (Lun Tha) are exquisitely poignant as the doomed lovers. Their two duets, "We Kiss in a Shadow" and "I have Dreamed" are major highlights of the show. What's more, anyone who can resist the multitude of little children in this cast probably also gets pleasure from kicking puppies. "The March of the Siamese Children" most surely deserves a special Tony for cuteness. 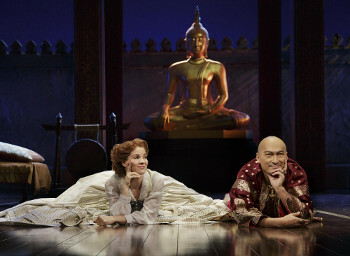 "The King and I" also doesn't lack for humor, most of which comes from the cultural clash between the king and Anna. Although it sometimes can be hard to understand him, Watanabe handles "A Puzzlement" with an effective mix of conviction and self-doubt. The act two ballet, "The Small House of Uncle Thomas," is performed by a large corps de ballet and soloists who give us pause to enjoy dancing as pure joy. Choreographer Christopher Gattelli has channeled Jerome Robbins in the best possible way. And then there's Michael Yeargan's magnificent set, which starts off as the ship bringing Anna and her son, Louis (the very fine Jake Lucas) to Siam, and then takes us into the king's sumptuous palace. Also thrown into this splendid mix are Catherine Zuber's costumes, which contrast Victorian England with exotic Asia, and give Anna lots of swirling skirt for "Shall We Dance?" This season, critics have focused a lot of attention on musicals that break the mold. They seem to be drawn to shows that introduce non-traditional musical genres and themes, as well as pared-down productions that appeal to certain aesthetics as well as producers with slim pocketbooks. However, time and again, theatergoers have demonstrated that when it comes to musicals, less is less. Fortunately, director Bartlett Sher has spared no pains, and his producers have allowed him to spare no expense, to make This King and I something wonderful.